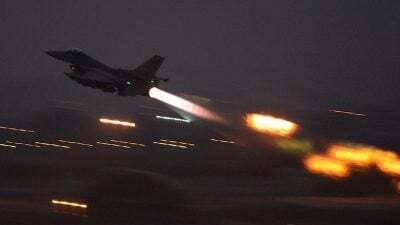 The Syrian Army is alleging that Israeli jets struck positions dozens of times within Syria early Tuesday morning in the al-Qutayfa area east of Damascus. According to a statement by Syria’s General Command, the Syrian government’s air defenses not only intercepted all of the missiles Israel fired, but it even managed to counter strike one of the Israeli jets, the Jerusalem Post reports. While the strike is unconfirmed on the Israeli side, Prime Minister Benjamin Netanyahu referred to the recent assault during a lunch with NATO ambassadors in Jerusalem, according to the Post. “We have a long-standing policy to prevent the transfer of game-changing weapons to Hezbollah from Syrian territory. This policy has not changed. We back it up as necessary with action,” he said. Israel has hit Syrian territory over 100 times since the conflict began in 2011. It has also openly talked recently about bombing Lebanon. Each of these conflict theaters is aimed at containing Iran’s expanding influence. All of this begs the question: Why haven’t Iran, Syria, and/or Hezbollah in Lebanon responded directly? Striking the territory of a sovereign nation is not only an act of war, it is completely illegal without authorization from the U.N. unless it has been done in self-defense. Is it because Israel reportedly has well over 200 nukes all “pointed at Iran,” and there is little Iran and its allies can do to take on such a threat? According to the Guardian, Russian President Vladimir Putin reportedly instructed both Syrian President Bashar al-Assad and Hezbollah not to retaliate against Israeli strikes in Syria. The Guardian also notes that Israeli media has claimed Putin even proposed a deal that would prevent foreign powers from using Syria as a base for attacking a neighboring state, a blatant reference to Iran. While much of Syria’s air defenses are Russian-supplied, the Jerusalem Post notes that the far more advanced Russian S-300 and S-400 have not been used against Israeli jets, but Syrian air defenses have. This includes an incident in March where three anti-aircraft missiles with a 200-kilogram warhead targeted several Israeli jets. Clearly, Russia has no interest in getting involved in a spat between Israel and Iran. In fact, it can most likely use the impending conflict to further pursue its goals in the Middle East and successfully emerge as the major power broker, wedging the United States out of the area completely. Even now, Russia is continuing its support for the Syrian government to retake the remaining parts of Syria currently up for grabs, particularly in the Idlib province. Much of the media’s attention is focused elsewhere, like the protests in Iran. Make no mistake, the looming conflict between Iran and Israel via its proxy states could easily break out unless something drastic is done to diffuse it. On Tuesday, the head of the Mossad, Yossi Cohen, warned of the proliferation of accurate Iranian missiles in the Middle East. “If Iran is not rolled back in Syria, then the chances of military confrontation are growing. I don’t want to tell you by the year or by the month. I’d say even by the week,” he said. In the meantime, it is unclear how much Russia might tolerate a blatant attack on Iran if it extends past the disputed border area with Israel. Regardless, Iran and Russia will remain key allies in the years to come until Washington’s influence and control over the Middle East has all but completely eroded.